Is it possible to shipwreck your faith so that you lose your salvation in Christ? If so, how can we ever be secure in Jesus? Learn what the Bible really says on this important subject. Is it possible for the believer who truly trusts in Christ for his or her salvation to fall from grace and be lost? What does the Bible say? 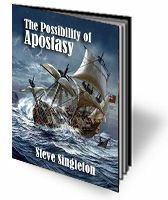 In this short yet in-depth study, you will find the passages in the Gospels and the rest of the New Testament clearly teaching that salvation is conditional. Yet this teaching does not contradict the equally valid and biblically supported principle that saved believers can be confident of their salvation. Here is a good study either for adult Bible classes, small groups, or personal examination "when you want to go deeper." The study concludes with suggested resources for going even deeper.